Varied and interesting subjects; Sharp clear printing; superb colour registration; thin carrier film. A quality product which allows the modeller to choose a scheme other than that found in the kit. AIMS is a company that started in February 2003. Usually they concentrate their efforts on the venerable Ju 88 so it was no surprise that the following 1:48 scale offerings made their appearance last year. There was one unexpected release however, and this came in the form of a decal sheet for the Me 321 “Gigant”. It is designed for the 1:72 scale Italeri kit and covers 3 interesting and varied colour schemes. 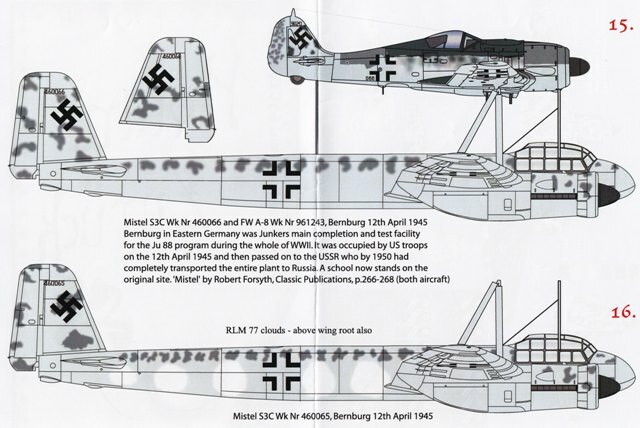 This aircraft was used in tests with He 111 ZV1 “DS+EQ” (a machine that AIMS also provides decals for on sheet 72D007). It was photographed taking off from Leipheim and wears the standard RLM 70/71/65 scheme. 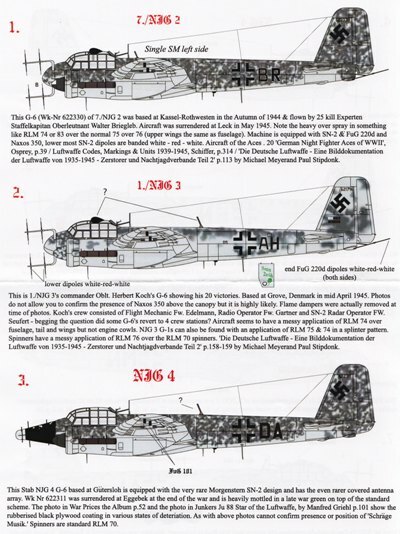 Seen in conjunction with He 111 Z “TM+KI” (see AIMS sheet 72D010) this machine is finished in temporary winter camouflage with very little of the underlying scheme showing through. The date and location are believed to be January 1942 at Kertsch in the Crimea. The combination of the above two schemes topped off with yellow wingtips and fuselage band make this the most colourful aircraft of the trio. Unfortunately no other details of its service history are available. The decal sheet was printed by the Fantasy Printshop and everything was in perfect register. The carrier film is very thin and is kept to a minimum around each item. Nine aircraft can be found on this release that covers three versions of the famous Ju 88. 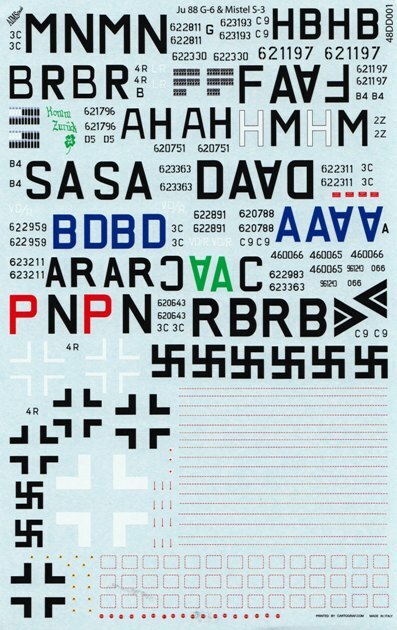 They are printed on a single sheet of A5 size decal paper, a feat made possible by only supplying enough national markings for a single aircraft. A fascinating diversity of colour schemes is available for the modeller to choose from. Whether it is a simple Mediterranean example or one with a complex “scribble” pattern, there should be something for all tastes. 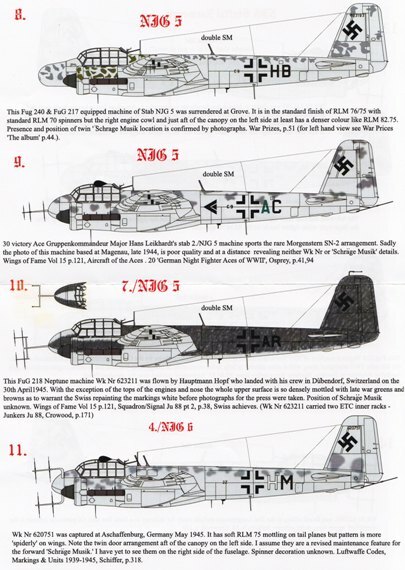 Ju 88, “9K+AS” of 8./KG 51. Based at Nikolajew, Southern Crimea during March 1941, this Ju 88 is finished in RLM70/71/65 with yellow wing tips and fuselage band. The spinners are in red. Ju 88 A-4, “5K+BP” of 6./KG 3. Seen in the Ukraine during mid 1942, the aircraft wears the same scheme as above but with the yellow extending to the spinners as well. The rare engine cowl marking has a slight error, as pointed out in the instructions, but this is minor. Ju 88, “7T+FH” of KGr 606. Although redesignated 1./KG 77 in Sept 1942, it still shows the old codes when flying in 1943. It’s also covered in the standard decor of the day and is flattered with an impressive collection of “kill” markings on the rudder. Ju 88 “F1+DP” of 6./KG 76, 1943. Thanks to its winter service on the Eastern Front, the aircraft is seen wearing the customary temporary “whitewash”. The contrasting engine covers make an interesting focal point as they still show their original camouflage finish thanks to what must have been a late engine change. Ju 88 D-1, “7A+LH” of 1.(F)/121. Seen in the desert scheme of RLM78/79, this machine was found by Canadian forces in Libya during 1943. It features the white theatre band around the fuselage and possibly under the wing tips as well. The aircraft carries the usual colours of RLM 70/71/65 but with additional patches of what is believed to be RLM79 and RLM65 on the uppersurfaces. 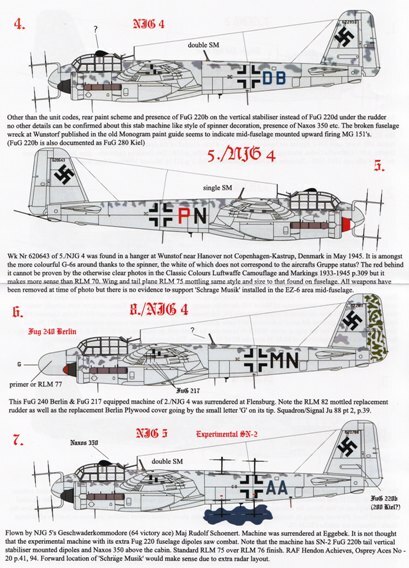 Although the profile lacks the white centres found in the fuselage cross, the correct versions are included on the decal sheet. Photographed in Catania, Sicily during the spring of 1943, it’s finished in RLM78/79 with white crested RLM80 stripes. The “scribble” on the under surfaces is also believed to be in dark green. Ju 88 A-17, “3Z+JT” of 9./KG 77. This scheme will really test the skill of the modeller. The RLM 70/71 splinter pattern is well hidden under the heavy RLM 76 “scribble” which also appears in RLM 70 or RLM 80 on the undersides. Based in Southern Europe during the Spring of 1943, it was one of the aircraft that carried rocket packs for assisted takeoff. Ju 88 S-3 of 1./KG 66. Having slid off a runway near Frankfurt in the winter of 1944, this machine gave the photographer a perfect opportunity to record the late war improvised “scribble”. It’s in RLM 82 over the upper surfaces, which in itself is a patchwork of presumed RLM 77/76. To help the modeller make their own conclusions regarding the colour schemes, AIMS thoughtfully provide the reference sources for all their profiles. 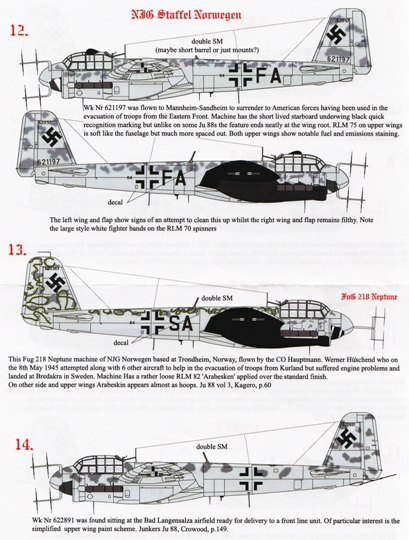 Apart from the allure of nightfighter operations, the Ju 88 is also popular for the variety of camouflage and antenna arrays seen on these aircraft. This sheet has 14 such combinations as well as a couple of “Mistel” trainers to choose from. In the autumn of 1944, this aircraft was based at Kassel-Rothwesten and was flown by 25 victory ace Walter Briegleb. It was given up at Leck in May 1945 and was equipped with SN-2, FuG 220d and Naxos 350. It’s the aircraft of another ace, this time Oblt. Herbert Koch, who managed to amass a total of 20 victories. In April 1945 it was at Grove in Denmark and carries SN-2 and most likely Naxos 350 although the latter is not visible in photographs. For those wanting something different, this scarce example of the Morgenstern SN-2 design is just the thing. Based at Gütersloh, it also has the rarer covered antenna array and was eventually surrendered at Eggebek in 1945. Not many details can be ascertained about this aircraft as the photo it comes from shows a machine in quite a state of disrepair. There is no FuG220d under the rudder but it does carry FuG 220b on the vertical stabilizer. This is another aircraft seen at Wunstof near Hannover in May of 1945. The red in the aircraft fuselage code and rear part of the spinner add a bit of extra colour. As well as the interest provided by the replacement rudder, this aircraft also features FuG 240 Berlin and FuG 217. The machine was found at Flensburg and a further focal point is the small letter “G” on the plywood cover. Although flown by 64 victory ace Maj. Rudolf Schoenert, this machine is not believed to have been flown in combat. It is experimentally fitted with extra FuG 220 diploes on the fuselage and carries Naxos 350 above the cabin and FuG 220b on the vertical stabiliser. This is the second aircraft featured on the sheet to carry FuG 240 and FuG 217. Twin “Schrage Musik” is located in the mid fuselage position and the mottle of multiple colours make it an attractive scheme to model. Based on a poor quality image, this profile shows the mount of 30 victory ace Major Hans Leikhardt. It was located at Magenau in late 1944 and is once again fitted with the rare Morgenstern SN-2 arrangement. Hauptmann Hopf flew this FuG 218 Neptune equipped aircraft when it arrived in Switzerland on 30 April 1945. Due to the dense mottle, the Swiss had to repaint the markings in white before releasing the subsequent photos to the media. Not much is known about this machine other than its capture at Aschaffenburg in Germany during May 1945. The soft mottling of RLM 75 on the fuselage sides is in direct contrast to the more web-like pattern on the wings. This interesting aircraft carries the black underwing colouring that was used as a recognition marking for a short period of time. It had previously been used to evacuate troops from the Eastern Front before being surrendered to the Americans. Sweden got an unexpected visitor when Hauptmann Werner Hüschend force landed his aircraft at Bredakra after suffering engine problems. He too was involved in evacuating troops in the final stages of the war. This is one machine that apparently didn’t get to serve with a frontline unit. It was lounging around at the Bad Langensalza airfield, waiting to be delivered to its new owners. These last two aircraft were found at the main test facility for the Ju 88 program at Bernburg in Eastern Germany. The Americans occupied the place on 12th April before handing it over to the Russians who eventually transferred the whole plant back to their country. 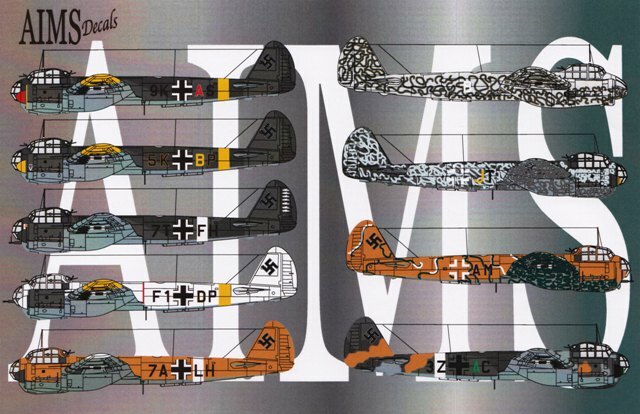 AIMS has provided an excellent variety of aircraft for the modeller to choose from, with plenty of colour schemes to cater for all levels of painting skill. 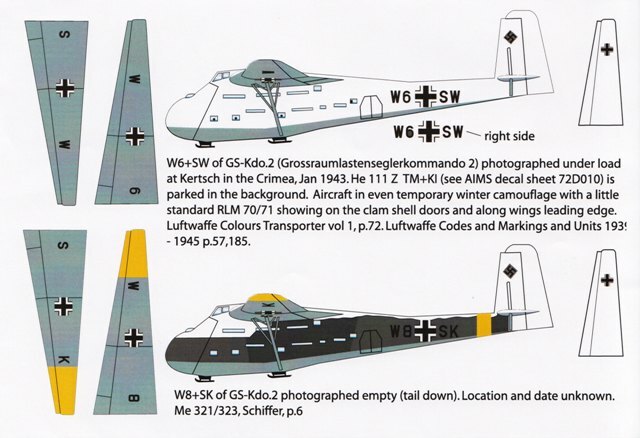 The referencing of subjects to the photographs they were based on is essential for Luftwaffe aircraft. Thankfully the manufacturers do this, as it allows the builder to make up their own mind should they disagree with a conclusion. It would have been nice to have a representative topside painting guide regarding some of the profiles though. The period images of some of these aircraft show quite a different pattern to that seen illustrated on the fuselage sides. 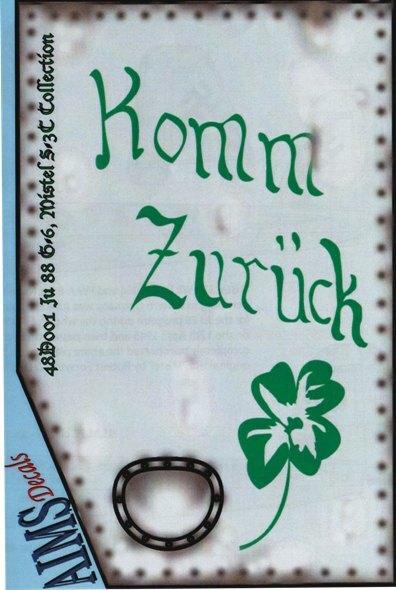 Each sheet was printed with perfect registration and the carrier film is commendably thin. 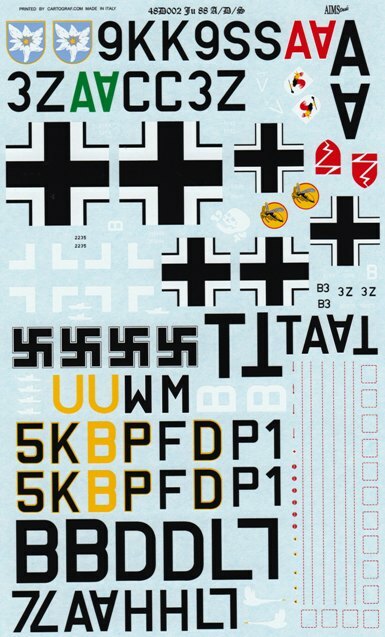 The end result is three more quality decal sheets from which to pick your next favourite Luftwaffe subject.